Today's mild, drizzly conditions and a 14-21 knot south easter were a stark contrast to the 30+ knot wild winds that whipped up the fleet earlier in the week. There was a rare whale sighting of a mother and calf humpback in Whitsunday Passage, breeching as Bob Oatley’s supermaxi Wild Oats XI approached. 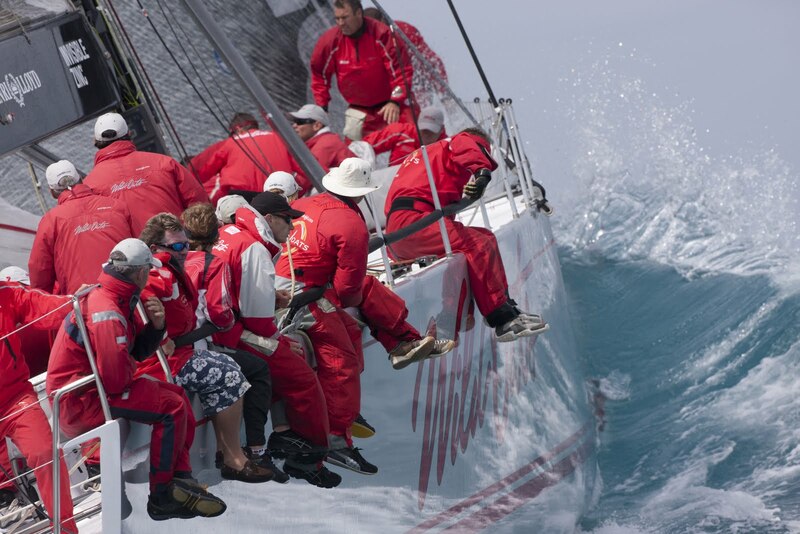 Wild Oats XI continued to dominate line honours to finish ahead of Investec Loyal and Lahana. Hooligan's overall win, their seventh from nine starts, sees Marcus Blackmore's TP52 in an unbeatable position on nine points well beyond the grasp of their nearest rival, Loki on 19 points. It’s a similar story in IRC Class B, Darryl Hodgkinson’s Beneteau 45 Victoire five wins, two seconds and today’s third setting them up for an appearance on the stage at tomorrow night's official trophy presentation. It is far from over in the remaining divisions of the the competition particularly in Performance Racing Division 2 where just two points separate the first six boats on the leaderboard. “When it’s that close, you have to sail your own race and not worry about the tactical situations of the others,” said leading skipper Tony Coleman, one of three sitting at front of the pack on 38 points with his Sydney based J133 Euphoria. Coleman’s secret weapon this week is one of the Island’s medical staff members who has never sailed before but has been on board for a day one win and also today’s win in one of the windward/leeward races. “She thinks sailing’s so easy,” laughed Coleman. Of course she’s been invited back for tomorrow’s ultimate race.